D-Day landings. US Coast Guard-manned LCVP disembarking troops on the morning of 6 June 1944 at Omaha Beach in one of the first waves of the D-Day landings. The unit was Company E, 16th Infantry Regiment, 1st Infantry Division. 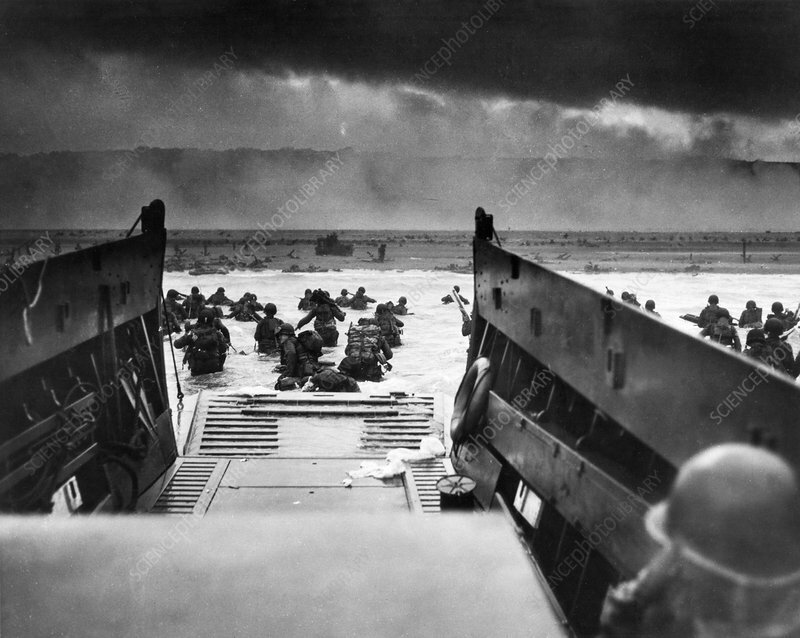 Omaha Beach saw the fiercest fighting, and this photograph became an iconic image ('Into the Jaws of Death'). The D-Day landings were the largest seaborne invasion in history. They successfully liberated the Normandy coast of Nazi-occupied France, contributing to the Allied victory in World War II. During the landings, the Allied force of some 156,000 (from the UK, USA and Canada) took some 12,000 casualties and suffered more than 4000 dead.